If you’re running a law firm and looking to gather more clients who are searching for attorneys online, then you need to know about law firm SEO. In this post, we break down 11 factors to help your increase your Law Firm’s search engine rankings. Simply put, SEO is a way to ensure that your law firm’s website jumps to the top of the search engine results pages (SERPs) when people search for keywords related to your legal expertise. For example, if you’re a patent attorney located in Phoenix, Arizona, wouldn’t it be great if people see your law firm’s name at the very top of the search results when they search for “patent attorney in Phoenix Arizona”? Of course, it would. You’ll get more inquiries about your business that way. And more inquiries generally lead to more clients. Here are some example searches. You can also see there are many searches even for niche law practices. You can think of SEO as an extension of marketing. You probably already run ads and use PR to promote your law firm. You use SEO as well. Here’s a simple guide to law firm SEO that works. Recall the example above about somebody searching for a patent attorney in Phoenix, Arizona. That “Phoenix, Arizona” part is extremely important for SEO purposes. The reality is that you’re probably marketing for local clients. That’s why you need a specific type of SEO called Local SEO. Local SEO optimizes your website so that people find it when they’re searching for a law firm in their region. In the case above, Google understood that somebody was conducting a local search because “Phoenix, Arizona” was added to the search query. So Google would return results that are local to Phoenix. Unless you’re a well-respected national or international law firm, chances are pretty good that you should begin your SEO efforts with Local SEO. Keep in mind, this both Google My Business and your HTMP page. Maybe we shouldn’t judge a book by its cover, but Google judges websites by their titles all the time. That’s why your title needs to explain what you do in just a few characters. Fortunately, website technology makes that very simple with the <title> tag. Use that tag to explain to the world who you are and why somebody might be interested in hiring you. Once you’re done with your title, it’s time to move on to adding a description about your law firm. Unlike the title, the description doesn’t have its own named tag. It’s really just an attribute of a <meta> tag. Note that the example above hits all the right points: it explains who you are, what you do, and where you’re located. Plus, it adds a little marketing (“more than 15 years of experience”) that’s too long for a <title> tag. That’s the pattern you want to follow in your own description. Populating your title tag with valuable information for Google is pretty easy to do. This next step is a little more involved. Why? Because it’s very close to writing code just like professional software developers do. Schema.org is a markup language that you need to include on your website if you want to rank locally. That’s because the markup makes it exceptionally easy for Google to learn a lot about your business. There are numerous parts to Schema.org. Fortunately, you don’t need to learn them all. When optimizing your law firm’s website, you can start by just learning about the Local Business part of schema.org. Specifically, pay attention to the “address” element. You’ll use that element to add in your business address. 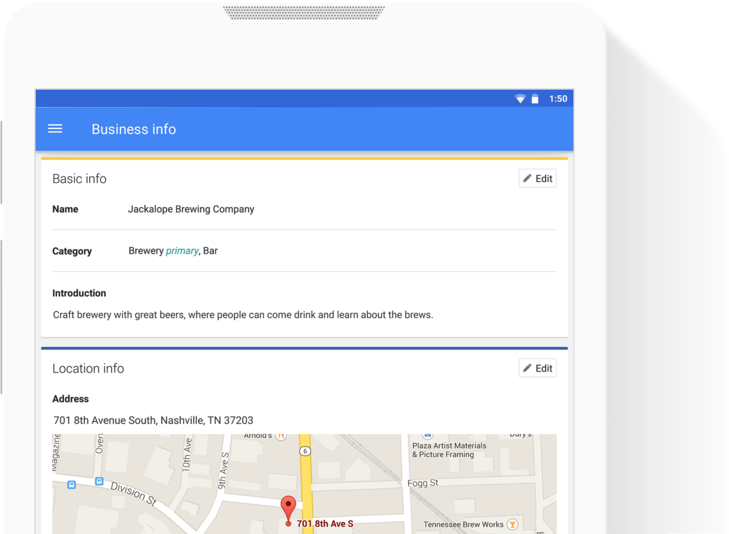 Again, you’re doing this to make it easy on Google to determine the location of your business. That’s very important for Local SEO. There’s an important point here, though. It’s that you decide how you want your name and address to appear and stick to it everywhere you reference it. For example: If your business is located at 123 Maple Street, and you prefer to abbreviate “Street” with “St.”, then you must list your business that way online all the time. Otherwise, you’re going to limit your chances of reaching the top of the search results. Of course, there are numerous other Local Business elements that you’ll want to use as well (“email”, “legalName”, “telephone”, etc.). The more info you add, the more you’re telling Google about your business. That’s a good thing. A full overview of how to implement schema.org markup on a website is beyond the scope of this tutorial, but you can read all about it here. Sticking with the theme of letting Google know where you’re located, it’s a great idea to add a Google map to your “About Us” or “Contact Us” page. Fortunately, that’s easier to do than adding schema.org markup. Just head over to Google Maps, navigate to your location, and click “Share or Embed map” from the menu in the top, left-hand corner. At the top of the box that appears, select “Embed map.” Then, choose the size you want and paste the code into your own web page. If you don’t already have one, now is the time to get a Google My Business (GMB) page. That will help with Local SEO as well. A GMB page will provide Google with a wealth of info about your business, including its location. Yes, this step is necessary in addition to everything else you’ve already done. Remember: the address you use here must appear exactly the way it appears elsewhere. Also, be sure to correctly categorize your law firm on the GMB page. That will help your site rank when people search for keywords relevant to your area of practice. Finally, make good use of the “Description” field on the GMB page. Use it to hit all the right notes (explain who you are, what you do, and where you’re located) and market your business. Please note: it’s best to use the “Description” field to market your business to customers and not to over-optimize it for search engines. In other words, the description should look natural and not appear as text stuffed with a bunch of keywords related to your niche. It is also a good idea to place a few links in the description to your website. Yes, there is yet another place you need to enter your address. Remember, this all pays off with more clients. Create a Google+ Local page for your business and enter its information there. Keep in mind the usual warning about being consistent with the name and address. Once you’ve scattered your law firm’s address about cyberspace, it’s time to reference it with citations. What are citations? They’re listings of your business name, address, and phone number (NAP) on another website. By now, you shouldn’t be surprised to know that you must list your business address on other websites exactly as it appears everywhere else. Citations are important because they give your law firm the appearance of authority. That’s a ranking signal that Google uses when determining which businesses go to the top of the results list. You should obviously include your NAP in any law firm or business directories online. Pay particular attention to directories relevant to your expertise (for example, a nationwide directory of patent attorneys). You can also add citations on other online properties as well. If you write a blog post for another site, be sure to include your NAP at the bottom of the post. Also, make sure your NAP is included in press releases that go online. Finally, if you’re posting to forums, add your NAP to your signature. Google also uses reviews as a ranking signal for law firm SEO rankings. That’s why you want plenty of positive reviews. How do you get reviews? Ask for them. Seriously, call up some very happy clients from the past and ask them to leave reviews on your GMB page. Although the debate rages within the SEO community about whether or not social signals are a ranking factor, one thing is for sure: they can’t hurt. A social signal is a link to your website from one of the more popular social media sites, such as Facebook, Twitter, or Pinterest. Again, a good way to generate some social signals is to ask for them. Call some happy clients (or media outlets) and ask them to post a link to your site. You can also earn them on your own, though, with content marketing. All the best law firm SEO companies have some sort of social media and content marketing program. Content marketing is one way you can put your law firm ahead of its competitors. That’s because many law firms just don’t bother with it. But they should! They are also generally pretty bad at conversion rate optimization, but that is another topic. What is content marketing? It’s a way to rank in the search engines by posting articles related to your legal area of expertise. For example: if you’re a patent attorney, you could post an article entitled: “5 Myths About Patent Law.” In that article, you’d explain common misconceptions about patent law. Now, people who search for “myths about patent law” are likely to come across your article. That will give you some additional brand name recognition. Also, people who read articles that they really like tend to share those article on social media. That gives you more social shares, which in turn brings more people to your website and may help with SEO. The important thing about content marketing is that you do it consistently. Even if you only write a new article once a week, you should keep adding content to your website. Google loves new content. 1. What Are Some Attorney Marketing Strategies? Old-fashioned networking – Make sure you’re active in professional associations. Take clients out to lunch or dinner. Attend networking events. A User-Friendly Website – You shouldn’t just make sure that your website is friendly to search engines, you should also ensure that it’s friendly to people. Include a menu that makes it easy to navigate around your site. Add social proof. Use a responsive design so it looks great on any device. Online advertising – Never underestimate the value of PPC. You can attract new clients with local search ads. Email marketing – Maintain your relationship with clients by sending them emails every now and then. 2. Do I Need a Law Firm Marketing Blog? If you’re serious about law firm SEO, you should add a blog to your website and update it regularly. Why? Because content marketing is a great way to optimize your site for key search terms. Use a tool like SEMRush to uncover some of the more popular keywords related to your law firm’s specialty. If you have more than one specialty, find keywords relevant to each one. Then, produce helpful content optimized for those keywords. Make sure the content answers the kinds of questions you expect your clients to ask during initial consultations. You’ll also demonstrate your knowledge about the law when you practice content marketing. That’s going to help attract more business as well. 3. Is Law Firm SEO Better Than PPC? Both law firm SEO and PPC have pros and cons. When you optimize your site for search, you’ll get a boost in credibility as your site naturally appears at the top of the organic results list. You’ll also likely enjoy some long-term benefits associated with ranking well. That kind of optimization takes a while, though. PPC, on the other hand, offers immediate results as a cost-effective advertising solution. Pick the best option based on your business strategy. 4. Can I Handle Law Firm SEO on My Own? That’s because SEO is an ever-evolving discipline. The kinds of strategies that worked just a couple of years ago might not work anymore. Digital marketing professionals keep up with those changes in best-practices. They can make sure that your site is in tip-top shape. Also, when you outsource your SEO, you’ll have more time to focus on your clients. They’ll appreciate that. 5. How Is Geotargeting Related to Law Firm SEO? As a lawyer, you’re almost certainly looking for clients in your immediate area. Geotargeting can help you find them. Or, better put, it can help them find you. You’ll do that by geotargeting your content. 6. If I Hire an Agency to Do Law Firm SEO, What Can I Expect? First, people in the agency will interview you to understand your law firm’s goals. Then, they’ll analyze your site performance and identify areas of improvement. Next, they’ll research your competition and gather ideas for promoting your website. Following that, you can expect them to identify keywords related to your law firm’s specialty. They’ll use those keywords to create an editorial calendar. Finally, they’ll optimize your site for Local SEO since it’s almost certainly the case that you’re trying to appeal to a local audience. 7. How Long Does Law Firm SEO Take? Unfortunately, SEO can sometimes take a long time. Expect to wait at least six months before you see real results. That’s not because your SEO pros don’t know what they’re doing. It just takes that long for the search engines to “reward” outstanding optimization efforts. In some cases, it might take a whole year for a sound SEO strategy to bear fruit. 8. How Much Does Law Firm SEO Cost? If you’re running a small, single-practice firm, you might get away with spending only about $2,000 per month. If you’re running a larger firm, you can expect to spend at least $5,000 per month. Really big firms might spend as much as $20,000 per month. Remember the old adage, though: you get what you pay for. That’s especially true when it comes to hiring qualified SEO professionals. SEO for a law firm is mostly Local SEO (unless its a really big firm). However, you should also follow other traditional SEO best-practices such as content marketing and aggressively going after social signals. Once you’ve put some effort into optimizing your website, you should see its rank improve over time. Keep in mind, though, that good SEO is like good wine: it takes time to achieve the desired result. If you need help, contact us now. Thanks for updating me, i am facing some problems in my website SEO but after reading this post I am feeling really confident.